Definition at line 23 of file CStepMatrix.h. Definition at line 29 of file CStepMatrix.h. Definition at line 26 of file CStepMatrix.h. Definition at line 26 of file CStepMatrix.cpp. Definition at line 33 of file CStepMatrix.cpp. References CVectorCore< CType >::array(), mPivot, and mRows. Definition at line 47 of file CStepMatrix.cpp. References CVectorCore< CStepMatrixColumn * >::array(), CVectorCore< CType >::array(), CMatrix< CType >::array(), C_INT64, convertRow(), mBeyond, mFirstUnconvertedRow, mInsert, mPivot, mRows, CMatrix< CType >::numCols(), CStepMatrixColumn::push_front(), CVector< CStepMatrixColumn * >::resize(), and CMatrix< CType >::size(). Definition at line 129 of file CStepMatrix.cpp. References CVectorCore< CStepMatrixColumn * >::array(), and mInsert. Definition at line 50 of file CStepMatrix.h. References CVectorCore< CStepMatrixColumn * >::array(), end(), max, mBeyond, mInsert, CVector< CStepMatrixColumn * >::resize(), CStepMatrixColumn::setIterator(), and CVectorCore< CStepMatrixColumn * >::size(). Referenced by addColumn(), and CBitPatternMethod::buildFluxModeMatrix(). 65 //We need to update the iterators. Add the linear combination of the two columns to the step matrix if appropriate and remove columns if necessary. Definition at line 181 of file CStepMatrix.cpp. 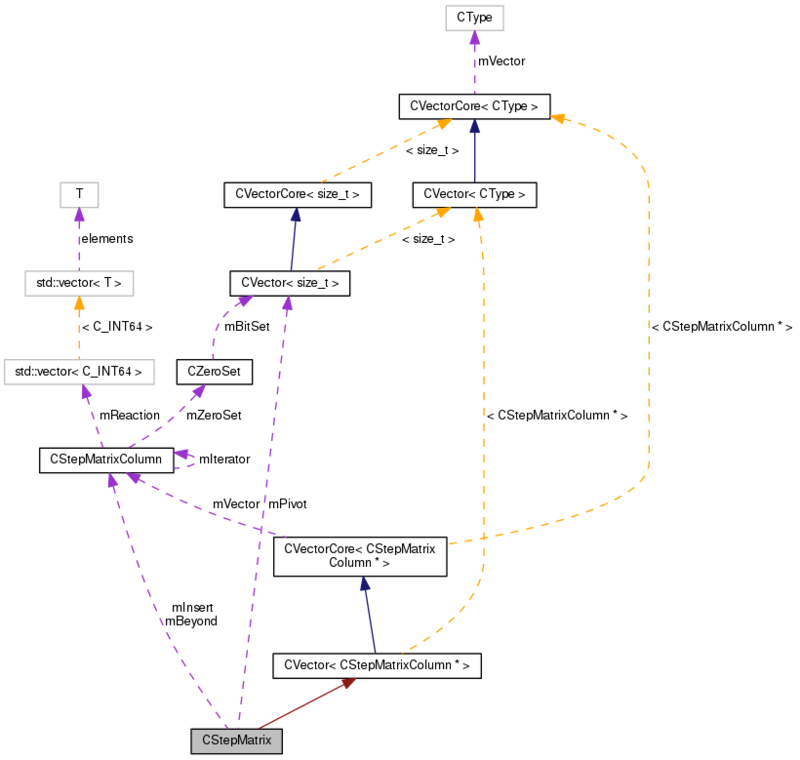 Referenced by CBitPatternTreeMethod::combine(), and CBitPatternMethod::combine(). Definition at line 289 of file CStepMatrix.cpp. References CVectorCore< CStepMatrixColumn * >::array(). Referenced by CBitPatternTreeMethod::buildFluxModes(), CBitPatternMethod::buildFluxModes(), and operator<<(). Definition at line 345 of file CStepMatrix.cpp. Referenced by CBitPatternMethod::calculate(), and CBitPatternTreeMethod::calculate(). Definition at line 142 of file CStepMatrix.cpp. References CVectorCore< CStepMatrixColumn * >::array(), mFirstUnconvertedRow, and mInsert. Referenced by CBitPatternMethod::calculate(), CBitPatternTreeMethod::calculate(), CStepMatrix(), and splitColumns(). Definition at line 299 of file CStepMatrix.cpp. 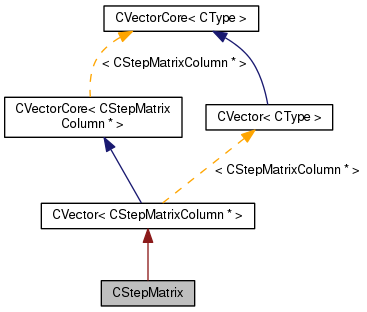 References CVectorCore< CStepMatrixColumn * >::array(), C_INT64, mFirstUnconvertedRow, mInsert, and mPivot. Definition at line 294 of file CStepMatrix.cpp. Referenced by add(), CBitPatternTreeMethod::buildFluxModes(), CBitPatternMethod::buildFluxModes(), operator<<(), and removeInvalidColumns(). Definition at line 249 of file CStepMatrix.cpp. References CVectorCore< CType >::array(), CStepMatrixColumn::getAllUnsetBitIndexes(), mPivot, and CVectorCore< CType >::size(). Definition at line 171 of file CStepMatrix.cpp. Definition at line 176 of file CStepMatrix.cpp. Referenced by CBitPatternMethod::calculate(), CBitPatternTreeMethod::calculate(), CBitPatternMethod::initialize(), and CBitPatternTreeMethod::initialize(). Definition at line 264 of file CStepMatrix.cpp. References CVectorCore< CType >::array(), CZeroSet::getNumberOfUnsetBits(), CStepMatrixColumn::getZeroSet(), CZeroSet::isSet(), mPivot, CVector< CType >::resize(), and CVectorCore< CType >::size(). Referenced by CBitPatternTreeMethod::getUnsetBitIndexes(), and CBitPatternMethod::getUnsetBitIndexes(). Definition at line 192 of file CStepMatrix.cpp. Referenced by CBitPatternTreeMethod::combine(), CBitPatternMethod::combine(), and removeInvalidColumns(). Definition at line 238 of file CStepMatrix.cpp. Referenced by CBitPatternMethod::calculate(), CBitPatternTreeMethod::calculate(), CBitPatternTreeMethod::findRemoveInvalidColumns(), and CBitPatternMethod::findRemoveInvalidColumns(). Definition at line 197 of file CStepMatrix.cpp. References CVectorCore< CStepMatrixColumn * >::array(), C_INT64, convertRow(), and mInsert. Definition at line 138 of file CStepMatrix.h. Referenced by add(), and CStepMatrix(). Definition at line 134 of file CStepMatrix.h. Referenced by convertRow(), CStepMatrix(), getFirstUnconvertedRow(), and getNumUnconvertedRows(). Definition at line 136 of file CStepMatrix.h. Referenced by add(), compact(), convertRow(), CStepMatrix(), end(), splitColumns(), and ~CStepMatrix(). Definition at line 132 of file CStepMatrix.h. Referenced by convertRow(), CStepMatrix(), getAllUnsetBitIndexes(), getUnsetBitIndexes(), and operator<<(). Definition at line 130 of file CStepMatrix.h. Referenced by CStepMatrix(), and getNumUnconvertedRows().